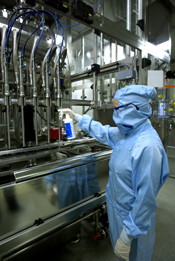 Pharmaceutical manufacturing takes place within a series of specially controlled environments – cleanrooms. 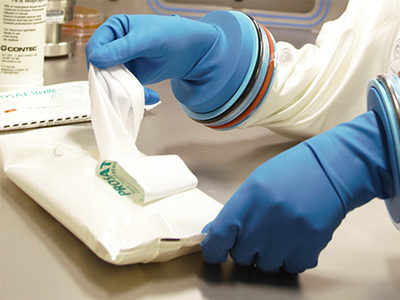 On one level, a cleanroom or clean zone is simply an area that is clean in terms of both particle counts (as defined in the international cleanroom standard ISO14644) and microbial counts (as defined in a second cleanroom standard for biocontamination control, ISO14698.1 In addition, regulatory requirements for cleanrooms are detailed by EU GMP or the FDA guidelines. 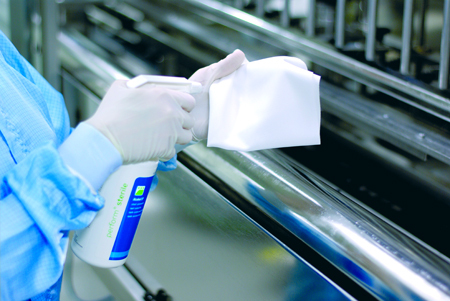 One important step towards achieving microbial control within a cleanroom is the use of defined cleaning techniques, together with the application of detergents and disinfectants. The detergents and disinfectants used in pharmaceutical grade cleanrooms need to be of a high quality and effective at killing micro-organisms. Both correct product selection and cleaning techiques are important, particularly in relation to some of the newer cleanroom technologies. Disinfectants have differing efficacies. Some are bacteriostatic, where the ability of the bacterial population to grow is halted. Here, the disinfectant can cause selective and reversible changes to cells by interacting with nucleic acids, inhibiting enzymes or permeating into the cell wall. Once the disinfectant is removed from contact with bacteria cells, the surviving bacterial population could potentially grow. Other disinfectants are bactericidal in that they destroy bacterial cells through different mechanisms, including: causing structural damage to the cell; autolysis; cell lysis and the leakage or coagulation of cytoplasm. Within these groupings the spectrum of activity varies, with some disinfectants being effective against vegetative Gram positive and Gram negative micro-organisms only, while others are effective against fungi. Some disinfectants are sporicidal in that they can cause the destruction of endospore forming bacteria. 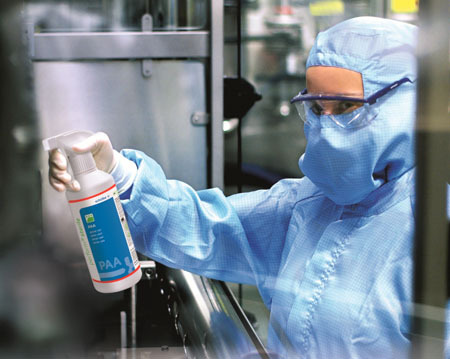 Pharmaceutical manufacturers are expected to use at least two disinfectants of different modes of activity in order to conform with current Good Manufacturing Practices.3 The use of a sporicidal disinfectant is recommended for sterile areas on an occasional basis, even where such a disinfectant does not form part of the standard set. 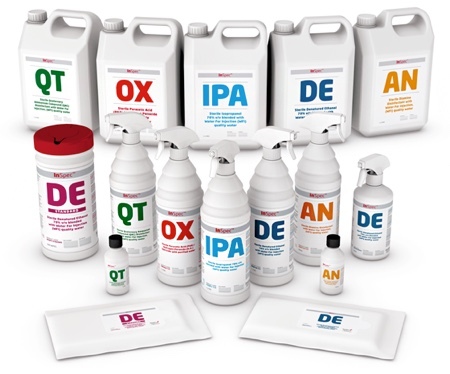 When selecting disinfectants, it is prudent to opt for manufacturers who offer a range of disinfectants of different modes of activity (which target and kill microbial cells in different ways). For a disinfectant to work effectively, “soil” (such as grease and dust particles) must be removed first using a suitable cleanroom grade detergent. Detergents are typically either sterile, neutral solutions or have added cleaning chemicals, such as premium sterile non-ionic surfactants. When selecting a detergent a check should be made to determine that it is compatible with the disinfectant because some detergents, where there are residues, can neutralise the active ingredient in certain disinfectants. This can be overcome where detergents are purchased from the same manufacturer as the disinfectant. It is important to understand the manufacturer of the disinfectant and to be assured that the cleaning agents purchased are of an appropriate quality. High quality disinfectants and detergents are manufactured under clean conditions, with the quality assessed through appropriate manufacturing techniques and for the product to be held in appropriate packaging. With disinfectants, it is also important that the chemicals have been tested to the appropriate European standards. Cleaning products presentation: As cleanroom technology has advanced, the types and ranges of cleanrooms and clean devices have expanded. The pharmaceutical manufacturer, when selecting cleaning agents, should aim for products that are supplied in different presentations. 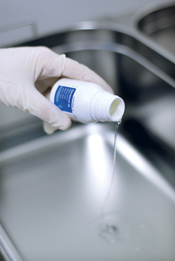 For smaller spillages and the cleaning of process area surfaces and laboratory benches, sterile disinfectants in trigger sprays are the most effective design. 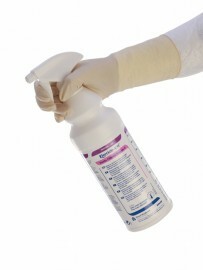 With slightly larger areas, ready-to-use disinfectant solutions in bigger volumes are desirable. For cleaning larger areas, such as process area floors, disinfectant concentrates (where the disinfectant is prepared by cleanroom operators by dilution) are the most appropriate presentation. Several manufacturers offer ready-to-use products in different volumes and concentrate solutions which are of great advantage for cleanroom use. Cleaning techniques for cleanrooms: The cleaning technique used for cleanrooms should be defined and standardised. It does not matter how effective the cleaning agents selected are if the cleaning technique practised by cleanroom operators is poor. This relates partly to the techniques used and partly to the quality of the cleaning materials. With the techniques for the cleaning and disinfection of cleanroom floors, either the “two-bucket” or the “three-bucket” technique is recommended. Both of these techniques involve using a bucket of disinfectant and a bucket of water. What such techniques do not achieve is the removal of disinfectant residue from the floors. To overcome this, the final stage in floor cleaning and disinfection is typically a rinse with sterile Water for Injection. For Grade A and B areas careful consideration is required as any water used will need to be sterile. Sometimes a major decontamination exercise is required for a cleanroom (such as following a HEPA filter failure or following maintenance work). There are different techniques used to decontaminate cleanrooms. Traditionally this has involved either manual cleaning and disinfection by operators using mops and buckets, or, in more recent years, decontamination with fumigation units and chemicals such as hydrogen peroxide or peracetic acid (noting appropriate health and safety regulations). For this method, gas generators can be placed in cleanrooms at known locations. This takes some time and effort in mapping the cleanroom (which additionally requires some form of validation using chemical and biological indicators). To aid such techniques commercial bucket and trolley systems are available. For aseptic filling areas it is important that these are manufactured from a material that can be autoclaved, such as stainless steel. In terms of the materials used for cleaning, appropriate mops and wipes should be used. Wipes should be sterile and be low particle shedding. When using wipes for surfaces, the detergent or disinfectant should ideally be sprayed onto the surface rather than the wipe and left for the required contact time before wiping is undertaken. With mops, the mop head should be cleanroom compatible (such as a microfibre-based yarn) and be single use. For Grade A and B areas, the mop heads should be sterile. Also of importance to such areas are the mops themselves, which should be autoclavable. The design of the mop is a further consideration and must be easy for the cleanroom operator to use and allow for a uniform application of the disinfectant solution. Some manufacturers of mops have consulted with cleanroom operators in order to design the mops in the most efficient ergonomic way. These “clean air devices” are categorised as barrier technology and are situated inside cleanrooms.6 Isolators, by their design, are less prone to contamination than conventional cleanrooms. This protection is maintained by a barrier between the inside environment of the isolator (at Grade A) and the outside environment. Both isolators and RABS require sanitisation. In the past, this was undertaken by wiping (the colloquially termed “spray and pray” approach). Today, the most common, and vastly superior, method is vapour technology. This is an automated process and is present with all isolators manufactured within the past 10 years (whereas with RABS, many are sanitised using manual methods). This is undertaken using a surface disinfectant, in liquid form, which is then heated in a specially designed chamber. As the liquid forms a vapour, it is carried into the isolator chamber or RABS area for a validated hold time. During this time the disinfectant vapour contacts the various surfaces within the clean air device and destroys those micro-organisms present. The disinfectants used for vapour disinfection must be sporicidal (products such as hydrogen peroxide, peracetic acid or similar products that utilise active oxygen). The use of such disinfectants requires extensive validation using spore- forming micro-organisms such as Geobacillus stearothermophilus. Isolators and RABS are said to “disinfect” or “sanitise” because absolute sterility cannot be demonstrated (sanitisation, in this context, is the reduction of a number of micro-organisms within the clean environment). In addition to sanitisation, spillages will occur inside clean air devices and occasionally personnel interventions are required for manual cleaning for which suitable cleaning products are required. Where such cleaning products are used it is of great importance that they are suitable for isolator use, in that such products must be aseptically filled or gamma irradiated and provided in double wrapping to minimise the introduction of contamination. 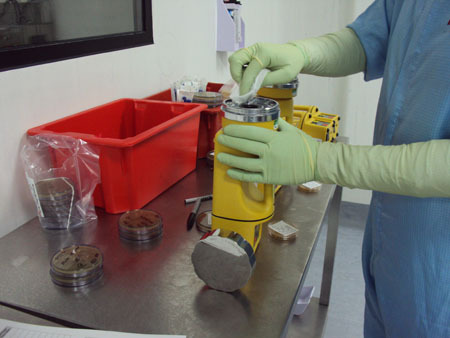 Cleaning products are also required in conjunction with disposable cleanroom technologies. 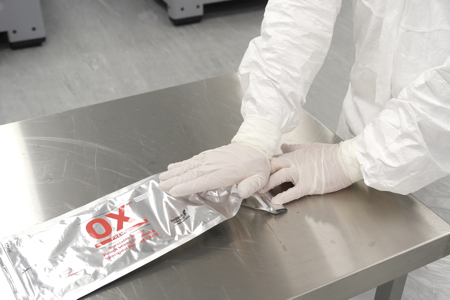 Although disposable and single-use sterile items do not require sterilisation or cleaning, contamination risks can arise when such items are transferred into cleanrooms via transfer hatches. Thus such “in–out” devices require cleaning and disinfection using traditional cleaning methods and cleaning agents of appropriate quality should be used. This article has examined some of the key criteria for the cleaning of cleanrooms and the appropriate use of disinfectants, detergents and cleaning apparatus in the pharmaceutical industry. While selection of the right type of cleaning agent and materials is of utmost importance, controlled and careful cleaning techniques must be applied. This philosophy applies to both conventional cleanrooms and to the application of the more recent advanced cleanroom technologies. The ultimate assessment of cleaning products and cleaning techniques is revealed through environmental monitoring programmes in terms of the numbers and types of micro-organisms recovered.7 Therefore, the construction of a cleanroom cleaning regime needs to be carefully planned and fit into an organisation’s quality systems. To aid such decisions, important technical advice is provided by many of the leading manufacturers of cleaning products. 5. G. Lee & B. Midcalf (eds): Isolators for Pharmaceutical Applications, 1994, HMSO, London. 6. ISO 14644 Clean rooms and associated controlled environments – Part 7: Separative Devices (clean air hoods, gloveboxes, isolators, and mini environments), 2004. 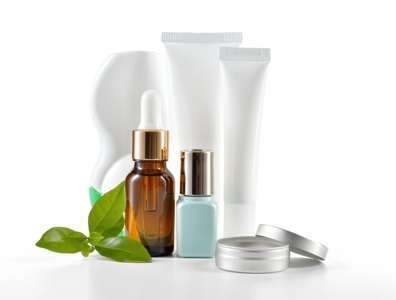 Preserving cosmetics – is nature winning?